Even though the study has male and female study participants this study is still more geared towards the men - why else do we have testosterone, but not estrogen measurements? As the scientists point out as early as in the title, a recent paper by Trexel et al. (2017) is indeed (at best) a "pilot study" to "evaluate changes in body composition, metabolic rate, and hormones during post-competition recovery" in "physique athletes". 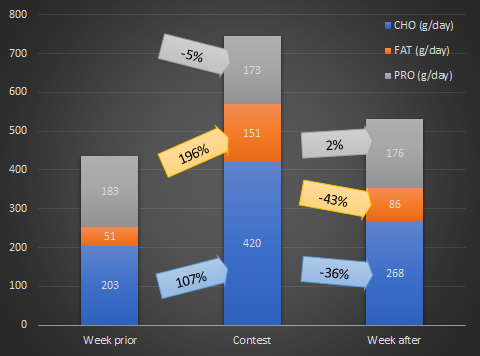 In view of the lack of reliable data from the contest preparations o bodybuilders and other physique-sport athletes, even this "pilot" data is more than worth reporting. Altogether the scientists were able to compile data from fifteen physique athletes - 7 male, 8 female drugfree (according to interviews) athletes competing in bikini (n=7), figure (n=1), physique (n=5), or bodybuilding (n=2) classes. Figure 1: Experimental design. RMR: Resting metabolic rate; BIS: Bioelectrical impedance spectroscopy (Trexel 2017). The graphical overview in Figure 1 gives you a good idea of when the different parameters were assessed. In that, it is important to note that this study did not as previously discussed studies track the hormonal and metabolic changes over the course of the contest prep - that should be obvious given the specific research focus on possible long-term negative effects of dieting, but in view of the way people often criticize studies for "shortcomings" that are actually a necessary consequence of the research question, I thought I'd better address that right away (see box below for corresponding data). But let's get back to what the study did measure, namely significant (p<0.05) changes for body weight, lean mass, fat mass and total body water. 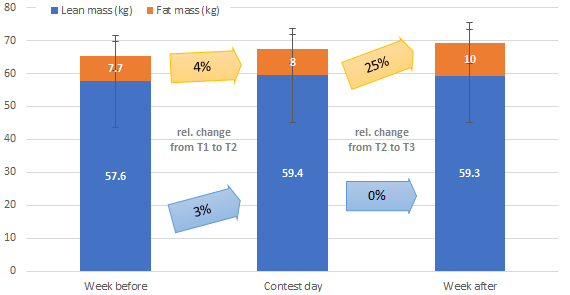 Figure 2: Changes in body composition; bars represent absolute values in kg, arrows and. rel. changes; the lean mass increase from T1 to T2, as well as fat gains from T1 & T2 to T3 were stat. sign. (Trexel 2017). The good news for every dieter and physique athlete is that the pre-competition RMR suppression was not markedly variable, as the data in Figure 3 goes to show you, but also "markedly reversed by overfeeding" (Trexler 2017). 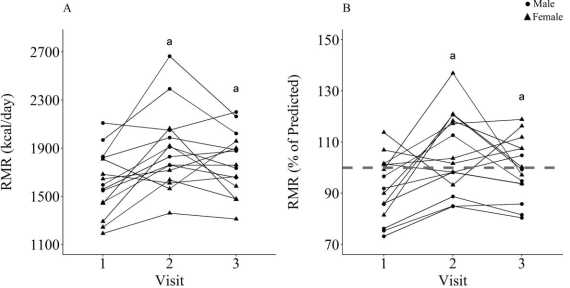 Figure 3: Individual responses for resting metabolic rate (RMR) as (A) raw or (B) percent of predicted values. a Significantly greater than T1 (p < 0.05). 2B: Dashed line represents 100% of predicted value (Trexel 2017). In other words, without reverse dieting, taking thyroid meds and all the other strategies you will read about on the Internet, all subjects bounced back toward normal levels following competition - albeit obviously not without significant fat mass gains over the 4-6 weeks immediately after the competition. With standard deviations that were 50% of the mean, the study doesn't give you any chance to say which macros are best for contest prep; arrows indicate rel. changes (Trexel 2017). Hold on, where's the baseline data? Yes, you spotted an important methodological issue of the study at hand: by using data from 1-weeks out, the scientists don't have independent non-dieting baseline readings or their subjects. With respect to their research question the scientists make up for that by comparing the measured RMR with a theoretical value they calculated based on the Cunningham Equation (Cunningham 1991). That's not ideal, but let's be honest: how "normal" is the aforementioned "gold standard", i.e. 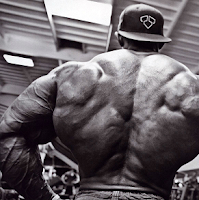 the actual measurement metabolic rate of a physique competitor in the off-season going to be? So, if you want to freak out, freak out about these: (A) even though the testosterone levels were likewise missing a baseline reading, Trexel et al. forgot to put their results into perspective (calm down, the end T level of 128 pg/ml is well within the normal range 75.8-156.8 pg/ml), and (B) there's a somewhat surprisingly sign. decline of the metabolic rate from contest day to the post-contest week that's not in line with the assumption that regaining normal body fat levels would restore an optimal energy balance - on the other hand, the 31% increased energy intake during the reload pre-contest may well explain the RER difference | Still, something worth discussing, I believe! Cunningham, John J. "Body composition as a determinant of energy expenditure: a synthetic review and a proposed general prediction equation." 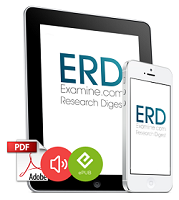 The American journal of clinical nutrition 54.6 (1991): 963-969. Trexel et al. 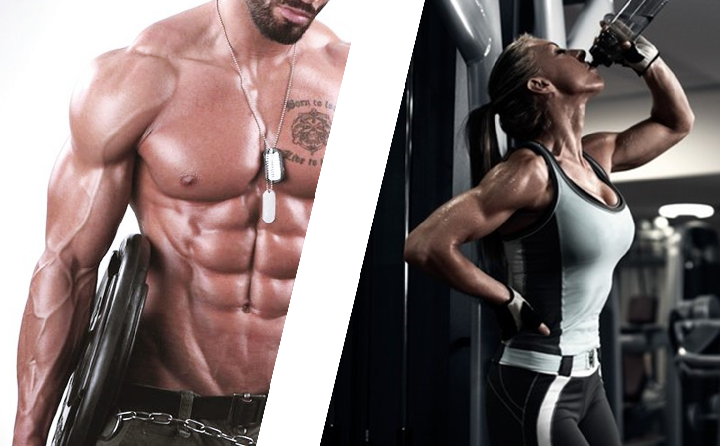 "Physiological Changes Following Competition in Male and Female Physique Athletes: A Pilot Study" International Journal of Sport Nutrition and Exercise Metabolism (2017) [Published manuscript].